Brookline firefighters have a new tool to save family pets rescued during fires and other emergencies. The department has received a donation of six sets of pet oxygen mask kits from at-home pet services provider Canine Company. 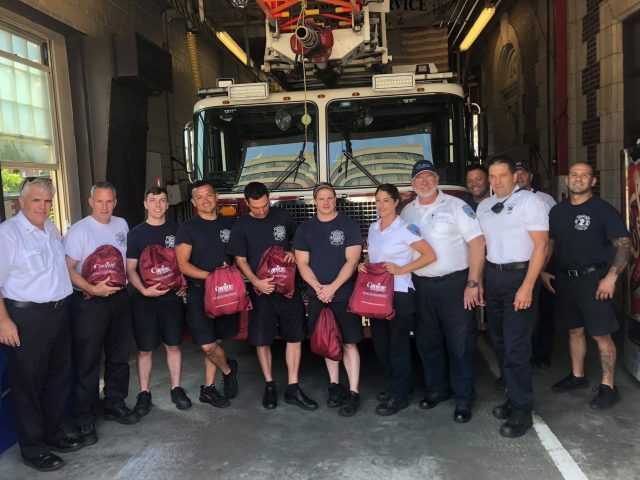 The kits were presented to Fire Chief John F. Sullivan on Tuesday, August 7, during a gathering at the Brookline Village Station by Michelle Perrotti, Canine Company’s Norfolk County representative. Perrotti demonstrated the masks with the assistance of Holly, a 5-year-old Springer spaniel mix. In the photo, Brookline Fire Chief John F. Sullivan tests one of the department’s new pet oxygen masks on Holly, a 5-year-old Springer spaniel mix, with the help of Michelle Perrotti of Canine Company as members of the department watch. Brookline Disaster Prep: What About Your Pets?